Heron valley Cocktail Yurt & the decking. Several hundred people lucky enough to have tickets for today sharing the magic of this most inspirational setting. By only selling tickets in advance, entering the site was calm and stress free, ample parking and tractors with trailers transporting visitors to the festival who didn’t fancy the woodland footpath. Hugh Fearnley -Whittingstall famous, or maybe infamous, for his cooking programs and more recently, his fierce and passionate educational TV series raising awareness of the fishing industry and his own war on waste, is as approachable and relaxed in the flesh as he appears on our TV screens. Passionate about food, animal welfare & that his fellow humans should be happy and enjoy the simple but best things in life. The long queues for his book signings show how loved he is, his generous humour and giving of his time is reflected in his staff and all the other traders and craftspeople invited to be part of his festival. 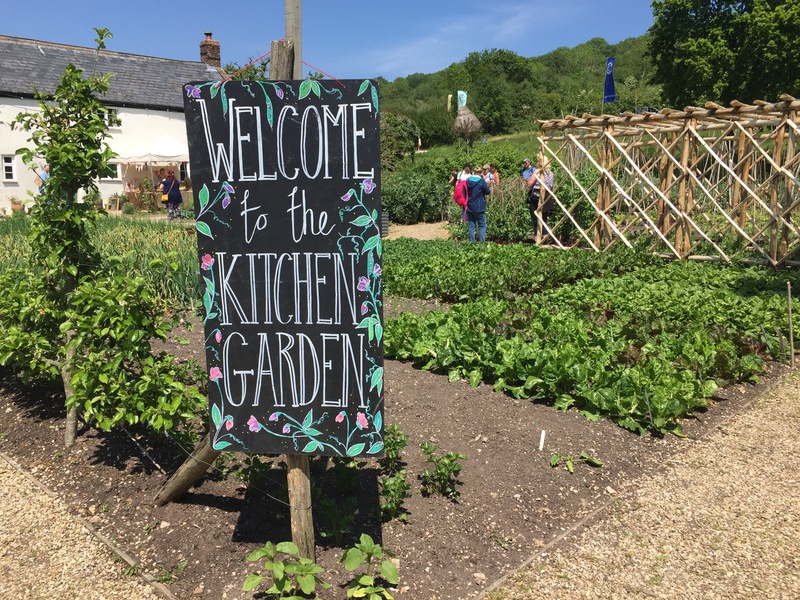 A school friend of mine celebrated her first year of working as part of Hugh’s team earlier this year, and to celebrate we met up for lunch at the ‘Canteen’ in Axminster and then I had a tour of the River Cottage HQ. 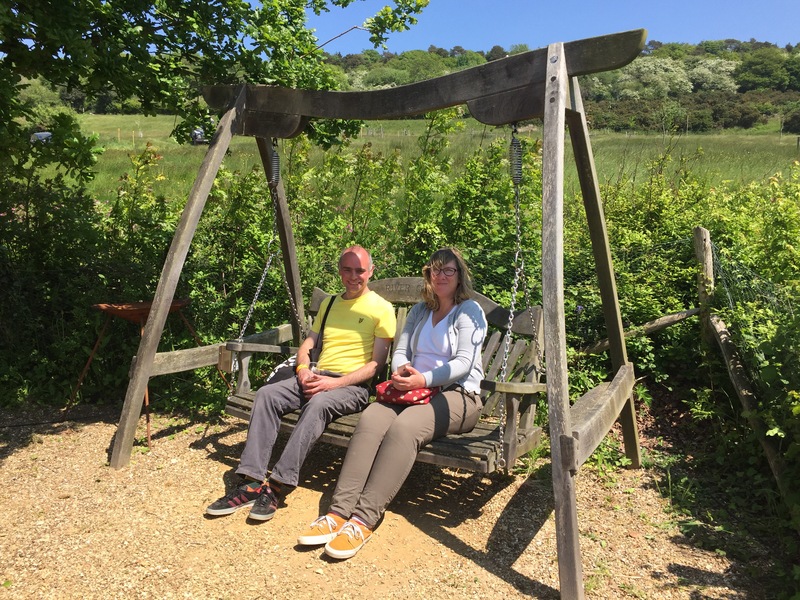 Debbie now has her dream job as an accountant at River Cottage, and its down to her enthusiasm that I came to hear about the Spring Fair and decided it experience it with a view to being part of it next year. We managed a 30 second catch up over my delicious River Cottage kitchen lunch, although it’s been all hands on deck this weekend, she still loves her job! One of the things I love most about life is how one persons joy is infectious and this could be seen all around the Spring fair. Hugh attracts like minded souls, his staff, colleagues, exhibitors and demonstrators were all spreading and sharing their and his passions for the best in quality food, drinks and crafts. There was also lots going on with Donkey rides, sheepdog displays, games for children and their parents, welly wanging & giant bubble blowing. On the main stage, Hugh did a cooking demonstration of fresh mackerel with a rhubarb & lovage sauce, passing the herbs and accompanying greens around the audience for us to all feel and sniff. Whilst cooking his right hand man Steven brought the mic to members of the audience to ask questions. I couldn’t resist the opportunity to ask Hugh about the effect of the EU referendum results on the fishing industry. He was both professional and inspiring as he complimented the EU on the progress that has been made regarding the fishing industry but how countries out of the EU, like Norway still didn’t have an idyllic fishing system. Without commuting to either camp, he also said there were bigger issues at stake which he felt trumped the fishing options. He answered with humour and compassion for both sides then suggested a poll amongst us, tactfully suggesting we all kept our eyes closed during the raising of hands! The result was close with neither side showing a clear win and still plenty of ‘undecideds ‘ meaning the vote really could go either way. Other questions included his thoughts on palm oil, what inspired him to become a chef, future TV projects and what Sheryl should cook for him if Hugh agreed to come to dinner! Rhubarb ‘darts’ were thrown into the audience to select two lucky diners to taste the completed dish. Sheryl & her husband Phil were also given a plate to share as a gesture of goodwill after it became clear that Sheryl would be cooking the meal for Hugh alone, and not as a family guest!! The main stage was booked with various demonstrations over the three day event, as was the smaller ‘decking’ with music and cooking. The atmosphere of all the visitors was that of joy and relaxed admiration as we learned about wood work and iron crafts, made our own felt balls with the very inspirational Lorraine, learned about sustainable farming from Paula of ‘One Hut full‘, and various foraging and guided tours and classes took place in groups around the grounds. The BEST chocolate from Solkiki. Run by an inspirational couple, Bob & Iris, who have sourced the rare set cacao beans and have spent many years fine tuning a magically simple yet perfect set of recipes. Now I can picture the venue and the clientele I need to decide what parts of Carnell’s of Castle Cary to take along next year. Greg’s cider would fit in perfectly, as would him demonstrating Trug basket making. My bees’ honey, wax polish, herbal teas also will be a good fit, as would demonstrating Skep making. All in all a great family day out. If you missed this year’s, make sure you take a look and book your tickets early next year!